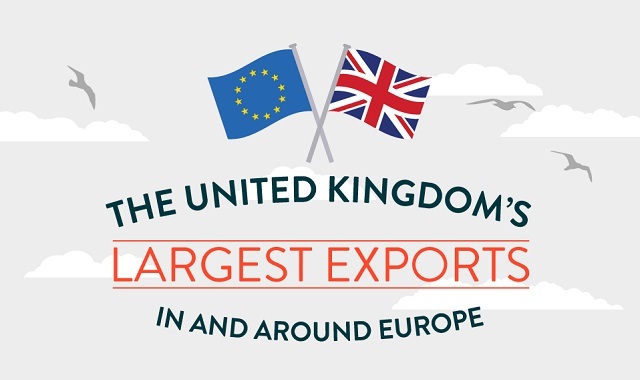 The United Kingdom’s largest exports in and around Europe #infographic ~ Visualistan '+g+"
With Britain about to leave the EU, we’re still yet to find out how Britain’s economics will be affected. On the day, the leaving party won the referendum with just 51.9% to 48.1%, a total turnout of 71.8% with more than 30 million people. While the pound did drop much like David Cameron predicted, the drop hasn’t been as bad as first anticipated. Currently, the pound is around 15% lower against the dollar and 10% down against the euro. Instead of shrinking, the UK economy has actually grown by 1.8% in 2016, second only to Germany at 1.9% among the G7 leading industrialised nations. Only time will tell how UK to EU exportation and trade will be affected. With the UK about to leave the EU, it also means the UK loses access to the Single Market and free movement of goods, capital, services and people. Without access to the Single Market, how will UK trade and exports hold up, with a total of 54.3% of the United Kingdom’s trade being delivered to the European Union in 2016?